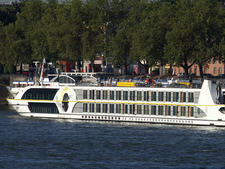 French-based Swiss Corona is the older sister of the identical ship Swiss Tiara, which sails on the Rhine and Danube. 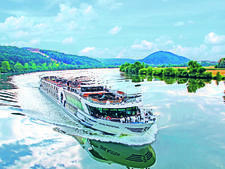 It is one of the "five-star" vessels operated by the U.K.-based company Riviera Travel, which also sells cruises on the U.S. and Australian markets. 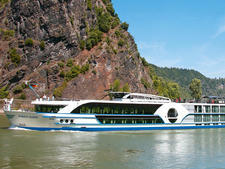 Launched in 2004 and carrying 144 passengers, Swiss Corona carries fewer passengers than other ships of the same size. 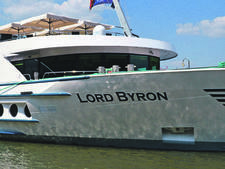 The vessel offers 4:1 passenger-to-crew ratio with high levels of personal service. Tastefully decorated, the ship has a traditional look that features a wealth of marble, wrought iron, highly polished woods and brass fixtures and fittings. The cabins are spread over three decks -- the lower Emerald, middle Ruby and upper Diamond -- and can all be configured as doubles or twins. Standard cabins measure 161 square feet and are situated across all three decks. They are identical, aside from the lower deck cabins having fixed windows that do not open. 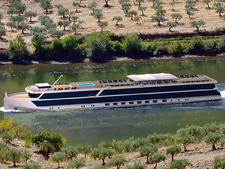 The cabins on the Ruby Deck and Diamond Deck have floor-to-ceiling French balcony windows, which slide open. There are a total of seven Superior Suites -- one on the lower deck, two on the middle deck and four on the upper deck -- which measure 193 square feet, with the extra space devoted to a larger living area. All the cabins are decorated in a neutral color scheme, with warm tones adding to the cozy but contemporary feel. Amenities in Standard cabins and Superior Suites include individual climate control, flat-screen TV and entertainment center, table and two chairs, safe, hair dryer, telephone, mini-bar, and tea and coffee-making facilities. The main restaurant has deep wool carpets, wood, glass and marble fixtures. With tables of four to six, the restaurant on the Ruby Deck operates on an open-seating basis, and passengers can choose where they want to sit. It serves a buffet breakfast -- with items such as omelettes prepared to order -- a buffet lunch and, four-course served evening meal. All meals are included in the fare. Tea, coffee and juices are served with breakfast along with water with lunch and dinner. There is also a complimentary 24-hour self-serve tea and coffee station. All other drinks are extra. The alternative dining venue is the Lido Bar, at the back of the ship on the Diamond Deck. It serves an early-bird breakfast, light lunch and is also used as a speciality dining room at night; passengers can make reservations once onboard at no extra cost. By day, the space is a quieter lounge and library and there is access to a small open-air seating area outside. 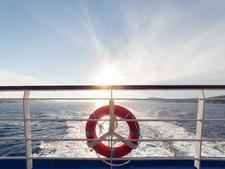 Forward on the Diamond Deck is the Panoramic Lounge & Bar, which is the social hub of the ship. It is carpeted and furnished with comfortable leather chairs, settees and tables, while panoramic windows allow passengers to enjoy the passing scenery. During the evening, a pianist plays. The Sun Deck, which has a small splash pool and putting green, is furnished with ample chairs and sun loungers. 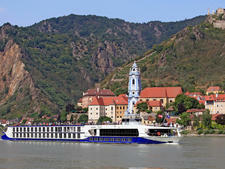 Other onboard facilities include a spa, with a sauna and steam room (unusual for a river vessel). There is a 24-hour reception desk, gift shop and laundry service is available, at extra charge. An elevator is available between the Ruby Deck and Diamond Deck, while the Sun Deck and Emerald Decks are accessed by stairs. 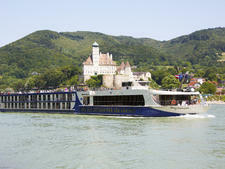 Swiss Corona sails on Rhone and Saone itineraries.